If you're not familiar with the candies, Ferrero Rocher are a chocolate candy made with a whole roasted hazelnut in a round chocolate shell that's filled with hazelnut cream and covered in milk chocolate and chopped hazelnuts. I was lucky to find a recipe online that I tweaked slightly so that it mimicked the candies more. Start with the cake. Sift together the flour, dark cocoa powder, baking powder, baking soda and salt in a large bowl. Set aside. In a medium bowl, combine the sour cream and vanilla and almond extracts. Set your wet ingredients bowl aside as well. Cream the butter and sugar in the bowl of a standing mixer fitted with a paddle attachment. Keep the mixer on medium speed until smooth, then set it on low speed as you add the eggs, one at a time, until combined. Starting and ending with the flour mixture, add the dry ingredients and wet ingredients mixtures in an alternating fashion. Scrape the sides of the bowl between additions and ensure each is properly combined before switching bowls. With the mixer still on low, slowly add the room temperature coffee into the batter and beat until combined. Preheat your oven to 350ºF. Divide the batter evenly into liner lined cupcake pans, filling each cup to about ½ full. Bake for 20 to 25 minutes, or until a toothpick comes out barely clean so as not to overbake, then set aside to cool. 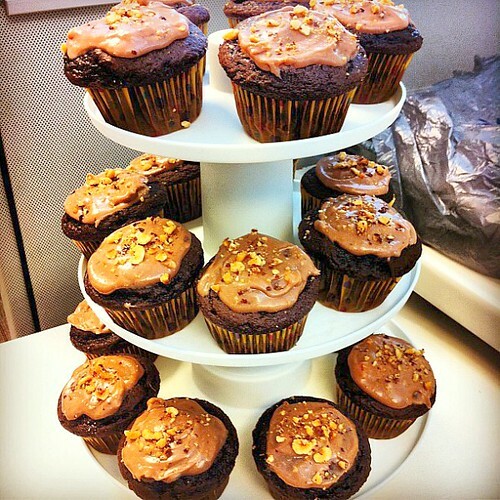 While the cupcakes are cooling, start the ganache. In a saucepan over medium heat, warm the heavy cream. Slowly add in the Nutella, small measured spoonfuls at a time, and stir in between additions until it is combined. When all of the Nutella has been added, set the saucepan aside to cool and thicken slightly. not cut so deep that you cut clean through to the bottom. Remove the piece of cake and save for another use later or discard. Repeat this for all of the cupcakes. When the Nutella ganache has cooled, use a spoon to fill the hole with the ganache. 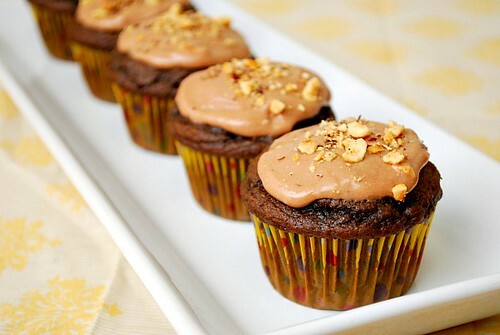 Top the center of each filled cupcake with a whole hazelnut. Set the cupcakes aside. Make the buttercream. In the bowl of your stand mixer, cream the butter and Nutella until combined. Add in the confectioner’s sugar in one cup increments, allowing each addition to combine before the next is put in. Continue creaming the mixture until it is all well blended. Adjust your mixer to a low speed and add the salt and vanilla extract to the mixture. Add the heavy cream, one tablespoon at a time, until your buttercream consistency is right. Adjust your speed setting to high to fluff the frosting, then transfer to a piping bag or tool. 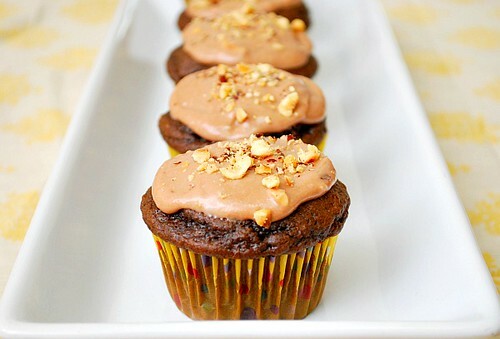 Pipe onto the cupcakes as desired, and top with finely chopped hazelnuts. Yields 36 cupcakes. Filling and buttercream recipes will be enough for approximately 24 cupcakes. My brother can eat an entire pack of Ferraro Rocher in one sitting. He would love this! 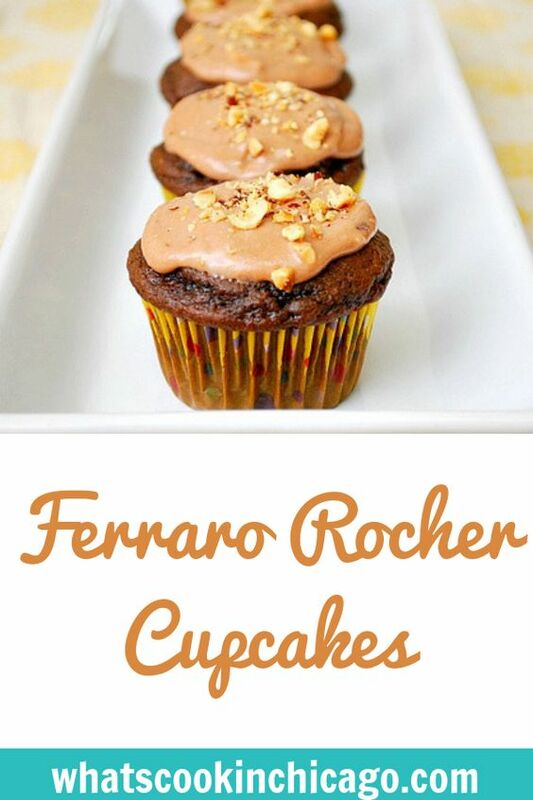 I love Ferraro Rocher! How do you make a better way to eat? Why not add them in cupcakes! Woot! Looks delicious! Waaaaaaaaaaaah! Ferraro!!!! I love that chocolate, mouth watering!